The Southern Coast is one of the hottest and most arid areas of Sardinia. An ample demonstration of such, is the natural vegetation found both in the coastal area and the higher land facing the sea. Instead, in the inner regions of Pula's Monte Santo, Is Cannoneris and Punta Sebera, the climatic conditions are different, because of the more consistent rainfall and a much lower average temperature, due to height and a cooler position. Along the coast we find savanna-like formations of mediterranean "barboncino" (Cymbopogon hirtus (L.) Janchen), The garighes of cistus (Cistus sp.) and lavender (Lavandula stoechas L.), bushes of wild olive and Lentisco (Oleo-Pistacietum lentisci Molinier 1951), clumps of arboreal euphorbia (Asparago albi-Euphorbietum dendroidis Biondi & Mossa 1992), of villous Sparzio (Calicotome villosa (Poiret) Link), and undergrowth of juniper turbinato (Oleo-Juniperetum turbinatae Arrigoni, Bruno, De Marco & Veri 1985 corr.). On the sand-dunes one often discovers ammofileto [Echinophoro spinosae-Ammophiletum australis (Br.-Bl. 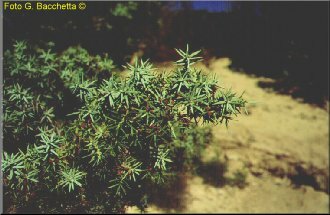 1921) Gehu, Rivas-Martinez & Tuxen 1972], the crucianelleto (Crucianelletum maritimae sigmetum) and the undergrowth of juniper coccolone (Pistacio-Juniperetum macrocarpae Caneva, De Marco & Mossa 1981), which, in the sone of Chia and Cape Teulada, reaches its maximum splendour. 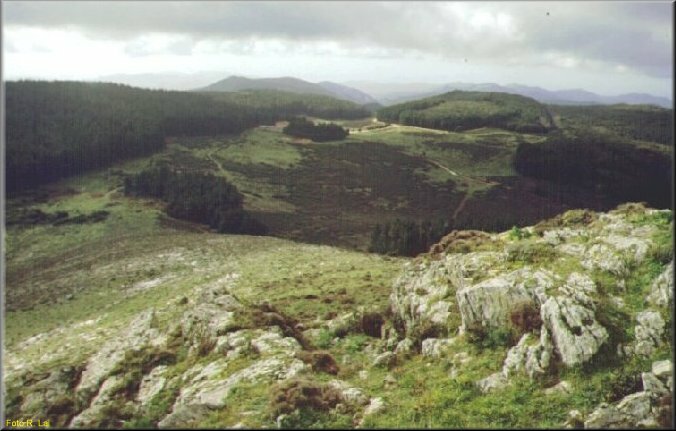 Limited to the more Western areas of Cape Teulada and particularly in the Port Pino zone, can be found woodlands of aleppo pine (Pinus halepensis Miller) and thorny oak (Rusco aculeati-Quercetum calliprini Mossa 1990). 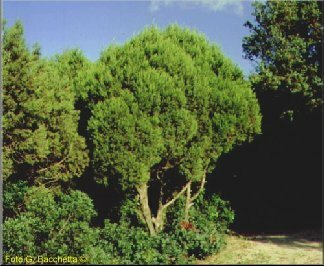 The most interesting species of bushes and trees in the coastal area, are surely the juniper coccolone [Juniperus oxycedrus L. ssp. 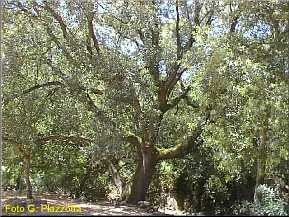 macrocarpa (S.& S.) Ball], the Valsecchi genista (Genista valsecchiae Brullo & De Marco), the thorny oak (Quercus calliprinos Webb), the aleppo pine (Pinus halepensis Miller) and the very rare olive-leafed Rhamnus [Rhamnus lycioides L. ssp. 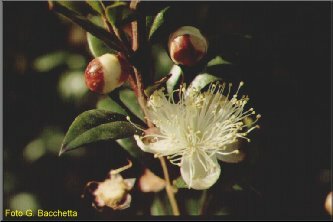 oleoides (L.) Jahandiez & Maire], found solely, in the whole of Sardinia, around Cape Teulada and the zone of Mount Santo of Pula. Among the most important endemic species exclusive to a given territory, are the Corsican silene (Silene corsica DC. ), statice (Limonium tigulianum Arrigoni & Diana), rock chicory [Hyoseris taurina (Pamp.) Martinoli], Moris' broom (Genista morisii Colla) and Terracciano's astragalus (Astragalus terraccianoi Valsecchi). Of phytogeographic interest is the very rare cressa (Cressa cretica L.) found only in the wetland of Piscinnì, the Sardinian celery [Apium crassipes (Koch ex Reichenb.) Reichenb fil. 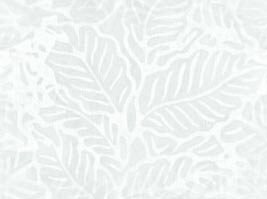 ], found in the area of Agumu and Ray's polygon (Polygonum raii Bab.). 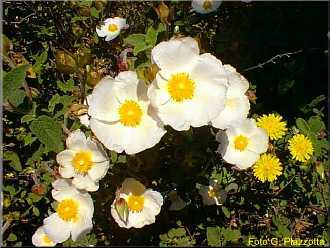 In the mountainous region however, we find underbrush of heath and arbutus [Erico-Arbutetum unedi (Mol.) All. & Lacoste 1980], woods of oak (Quercetum ilicis sigmetum) and subordinate formations of cork oak (Quercus suber L.). Also of interest are the woods - a mixture of holly (Ilex aquifolium L.) and clumps of yew (Taxus baccata L.) present in the area of Punta Sebera and Monte Santo of Pula. Worth citing among the endemic species of the hill and mountainous zones, are the Sulcis "spillone" (Armeria sulcitana Arrigoni), the broom of Etna [Genista aetnensis (Rafin.) DC.] and Soleirol's vitriol [Soleirolia soleirolii (Req.) Dandy]. 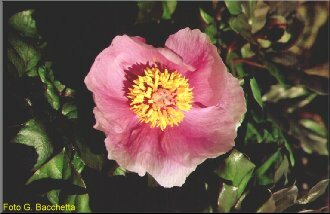 Instead, regarding phytogeographic interest, we have the splendid peony [Paeonia mascula (L.) Miller ssp. russii (Biv.) Cullen & Heyw.] found in the Sulcis only in the zone of Monte Santo of Pula and Punta Sebera, and the red foxglove (Digitalis purpurea L.) which sometimes reaches a flowering height of 40-50 cm. 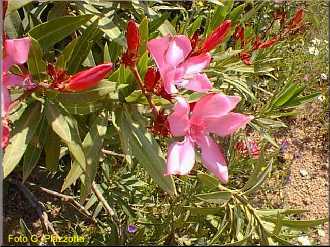 Relative to the riverine vegetation, usually all river beds are dominated by thick growths of oleander (Nerium oleander L.) or willows (Salix purpurea L., Salix alba L.), by sheltered woods of alder [Alnus glutinosa (L.) Gaertner] and to a limited degree in the final part of the Rio of Chia, by an underbrush which includes the agnocasto (Vitex agnus-castus L.), splendid for its lilac-blue flowers in summer.